Located 80 kilometers to the north of Hanoi capital, Thai Nguyen province borders Bac Kan province in the north, Vinh Phuc and Tuyen Quang provinces in the west, and Lang Son and Bac Giang provinces in the east. Covering some 3,563 square kilometers, the province has a population of around 1.2 million people and is home to eight ethnic groups with Kinh (Viet) being the most populous, followed by Tay and Nung. It has a provincial city with the same name, Song Cong town and seven districts (Pho Yen, Phu Binh, Dong Hy, Vo Nhai, Dinh Hoa, Dai Tu and Phu Luong). 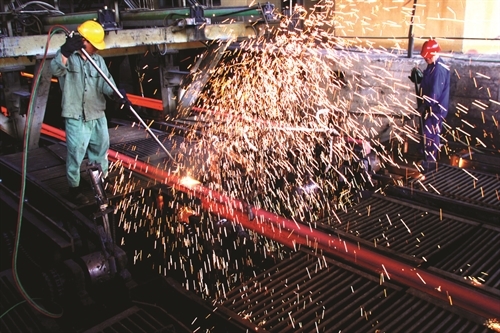 As the cradle of Vietnam’s steel industry and ranked second below Quang Ninh province in coal reserves, Thai Nguyen province is an economic hub of the northeastern midland and highland region. The province always attaches importance to and considers foreign direct investment (FDI) in its industrial parks an important source to promote the provincial economic growth, contributing to successfully achieving the target set by the 18th provincial Party Congress to turn the province into a modernity-oriented industrial one before 2020. The province is to date home to six planned industrial parks (IPs) covering 1,350 hectares, including the 220-hectare Song Cong 1 IP, 180-hectare Song Cong 2 IP, 350-hectare Diem Thuy IP, 200-hectare Nam Pho Yen IP, 200-hectare Yen Binh IP and 200-hectare Quyet Thang IP, and 32 industrial clusters occupying 1,213 hectares. Dao Minh Son, head of the provincial Planning and Investment Department’s External Economic Affairs Section, said that in the first two months of 2016, Thai Nguyen province granted investment licenses to three new FDI projects with a combined registered capital amount of USD 15.4 million USD. These three new projects, invested by the Republic of Korea (RoK), operate in processing and manufacturing industry. So far, eight countries and one territory - Brunei, China, France, the RoK, Malaysia, Japan, Germany, Singapore and Taiwan (China) - are running 102 investment projects worth more than USD 7 billion in the province. The invested sectors include processing and manufacturing, agriculture-forestry-fisheries, services and real estate business. The second phase of a hi-tech manufacturing complex project capitalized at USD 2 billion of the Republic of Korea’s Samsung Electronics Group in Yen Binh IP is the biggest FDI one in the province. Meanwhile, the Nui Phao mineral mining and processing project is the biggest joint-venture project between the Nui Phao Tungsten Refining Co. and Germany’s H.C Starck Group. The above results are attributable to its eighth spot in the 2014 provincial competitiveness index (PCI) ranking and its ever-improved Provincial Governance and Public Administration Performance Index (PAPI). The year of 2014 was also the first year Thai Nguyen entered the top 10 administrative management group. Addressing a ceremony to honor outstanding entrepreneurs and enterprises in the province on February 29, Chairman of the Vietnam Chamber of Commerce and Industry Vu Tien Loc highlighted Thai Nguyen, one of the country’s leading localities in PCI and FDI attraction and Samsung’s largest location in the world. “Thai Nguyen is also a destination of major projects such as Nui Phao mining project; energy, mechanical and metallurgy projects and the Nui Coc lake tourism site,” he said, expressing his belief that under the provincial administration’s leadership and the province’s breakthroughs in administrative reform and the improvement of investment environment, Thai Nguyen would continue to maintain its leading role in administrative reform and investment attraction. For his part, chairman of the Thai Nguyen provincial People’s Committee Vu Hong Bac has pledged to step up administrative reform and compensation for site clearance, attract investment sources and facilitate enterprises’ effective production and business activities and active international integration. Thai Nguyen province is expected to attract around USD 200 million in FDI this year and USD 1 billion in the 2016-2020 period. According to head of Thai Nguyen province’s IP Management Board Phan Manh Cuong, in the coming time, the province will promote the attraction of large-sized, environment-friendly and hi-tech FDI projects as well as those with sourcing technology and high added value, especially information technology ones associated with technology research and development, in order to create an impetus and socio-economic spillover effect inside and outside project areas. Thai Nguyen province will also focus on FDI projects specializing in finance-banking, mechanical engineering, manufacturing, automobile manufacture and assembly and other allied industries to serve the main industries and electronics sector. To gear up its investment promotion activities, the province will further reform administrative formalities for investment licensing applicable to foreign investors and remove difficulties for licensed FDI projects. In order to attract more investors, in addition to the Government-provided incentives, projects on the list of special investment priority sectors in areas with extreme socio-economic difficulties like Dinh Hoa and Vo Nhai districts will be exempted from land rental. Meanwhile, projects investing in the investment priority sectors are entitled to corporate income tax exemption for two years since the generation of taxable income and 50-percent tax reduction in subsequent three years. Furthermore, investors will be provided with information on the province’s socio-economic situation, its five-year and 10-year socio-economic planning orientations, current operations of enterprises, and business regulations and legal aid. 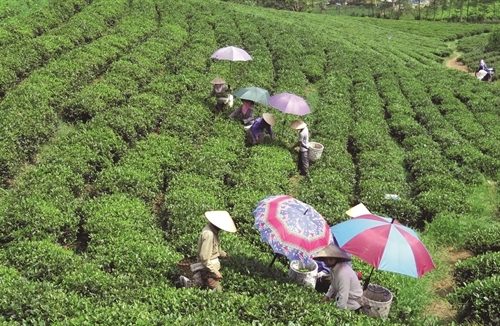 Thai Nguyen province is ranked second in the country in tea-growing areas. It is home to over 800 cultural and historical relic sites, including the Dinh Hoa safety zone’s historical relics which have been honored as a special national relic site, and 134 traditional craft villages, including 15 tea, two bamboo and rattan weaving and two handicraft villages. The province is endowed with beautiful landscapes like Nui Coc lake, Phuong Hoang cave, Mo Ga stream and Suoi Lanh lake. The Tham Roc puppetry of Tay ethnic minority, the festival to pray for good harvest of San Chi ethnic group, Soong Co singing of San Diu ethnic group, Tac Xinh dance of San Chay ethnic group and le cap sac (maturity ritual) of Dao ethnic group, just to name a few in the province, have been added to the list of national intangible cultural heritages. Worth of note, the Long Tong festival in Dinh Hoa, Chua Hang festival and Thai Nguyen tea festival have also created unique tourism products of the province. Aware of the role of the hospitality industry in its socio-economic development, Thai Nguyen has elaborated detailed plans and been implementing a number of projects, including the master plan on building the Nui Coc lake tourist site through 2020, with a vision toward 2030, and the scheme on the development of culture, sports and tourism in the province through 2020, with a vision toward 2030. At present, Thai Nguyen has a total of 350 graded hotels and guest houses with over 5,000 rooms, including one four-star hotel and five three-star hotels. According to Hoang Van Quy, head of the tourism section of the Department of Culture, Sports and Tourism, the province welcomed 7,000 foreign tourists in the first two months of the year. Over the past years, the province’s travel operators have organized tours to the cultural and historical relics, traditional craft villages and festivals and spiritual sites such as the Museum of Cultures of Vietnam’s ethnic groups, Tan Cuong traditional tea village and Thai Nguyen tea culture space. The province has also developed ecological, convalescence and MICE (meetings, incentives, conferences, exhibition) tourism. The province has also actively participated in the Thai Nguyen-Bac Giang-Hai Duong-Quang Ninh tourism development program and the 6th tourism program entitled “Through Viet Bac Heritage Sites” that involves Cao Bang, Bac Kan, Lang Son, Thai Nguyen, Tuyen Quang and Ha Giang. Its successfully organized Thai Nguyen Tea Festival in 2011, 2013 and 2015, which has helped promote the image of the province’s land, people, culture and tourism products. Each year, Thai Nguyen’s tourism promotion and information center publishes 5,000 guidebooks and 15,000 leaflets on the province’s tourism. The provincial Culture, Sports and Tourism Department launched a tourism portal at thainguyentourism.vn last November. The province is expected to welcome around 70,000 foreign tourists, mainly from the Republic of Korea, Japan, Australia, China and Southeast Asian nations and earn a turnover of VND 45 billion this year. According to Quy, Thai Nguyen currently has two RoK-invested tourism projects capitalized at around USD 5 million. They are the Grace hotel project in Pho Yen town and a project to upgrade the Song Cong hotel.